Of the various types of chisels and gouges, there are some that present a more formidable challenge (to me) than others. Here, I will demonstrate how I personally sharpen straight chisels (which is fundamentally the same as skew), curved gouges, and V gouges. Again, there are countless practises and techniques for sharpening just about everything, but this is what works best for me. Before we begin, here are the tools I will be sharpening (rather, using for photos) and the things I use to sharpen them. On the left is a leather strop saturated with 3-in-1 oil, although fine jeweller's rouge works well. I would, however, opt to use a grit substantially higher than the highest grit stone I have, somewhere around 12,000 mesh or equivalent. Next are four stones, a #220 for very rough shaping, then #1000, #5000, and #8000 for the sharpening. Only the worst of the tools see the #220, and for a previously established edge, even #1000 is a bit rough. There are dozens of types of stones out there, ranging from the India and Arkansas to Ceramic and Diamond plate, but they all work as long as you understand how to use them. I also brought out two needle files, one double-half round and one triangular. These help push the burr back over on the gouges, although I would recommend a slipstone instead for the inner surfaces. The only reason these work on my smaller chisels is because the chisels are extremely hard and are not shaped by the files. Rather, the files safely push the burr to the outside where I can remove it with the stones. On the bottom right is an angle measure (not something I actually use while sharpening, but for illustrative purposes) and a honing guide. The guide is not ideal for the long chisels, as it has a difficult time holding them securely, but it is another option that I will show for those interested. The chisels themselves are a collection of various shapes. The longer ones are a pair of straight and a pair of round gouges. The smaller are two gouges, one low number and one high, a V gouge, a straight and finally skew chisel. The skew and low number gouge (so small it was difficult to photograph) are effectively the same as the straight and high number gouge respectively. First, I will show how I sharpen the long chisels. 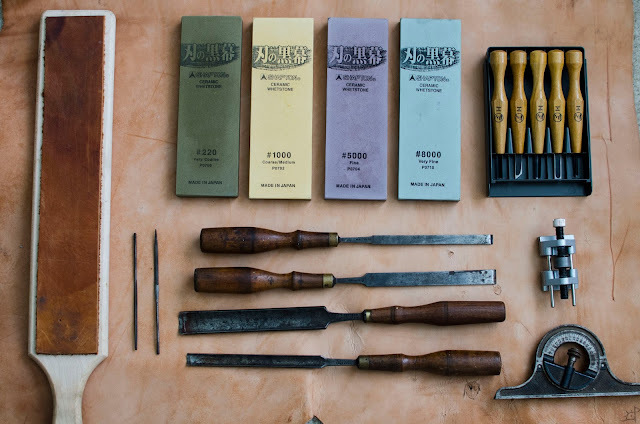 Whether mortising chisels, paring, firmer, or edge bevel, the theory is exactly the same. Mine are firmer (have a singly bevel on the edge, with square sides), and extremely old. 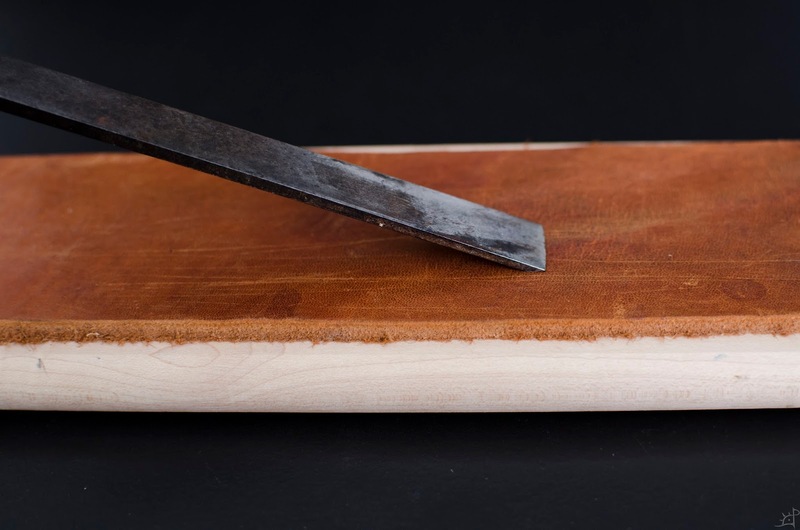 While they will take some time to get back to working condition, these are the steps to repair the edge and sharpen it. Foremost, it is important to establish a flat back. Whether new or old, this is the first thing I do to them. Out of the factory it will be close, but not perfect, and certainly not polished. At a slight angle to the stone, I keep as much of the chisel in contact as possible, while still having room to pass it over the surface. A chisel this long does not need to be surfaced all the way back to the tang, so I concentrate on the first 3~4" from the edge. When the entirety of the surface is uniformly ground, move onto the next grit, repeating to the highest, in this case #8000. To demonstrate the honing guide, I set it to an angle of 35 degrees. Some prefer it lower at around 30, but generally, the higher the angle, the more robust the edge. As this will be used for heavier carving, I keep it a little higher. 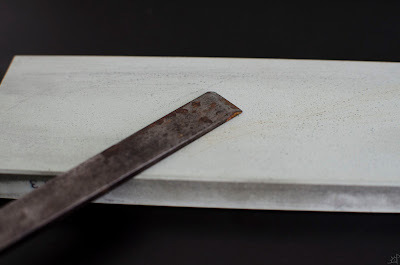 When sharpening any edge, I put pressure down on the forward stroke (as though the chisel is 'cutting' the stone) and relieve it when pulling back. 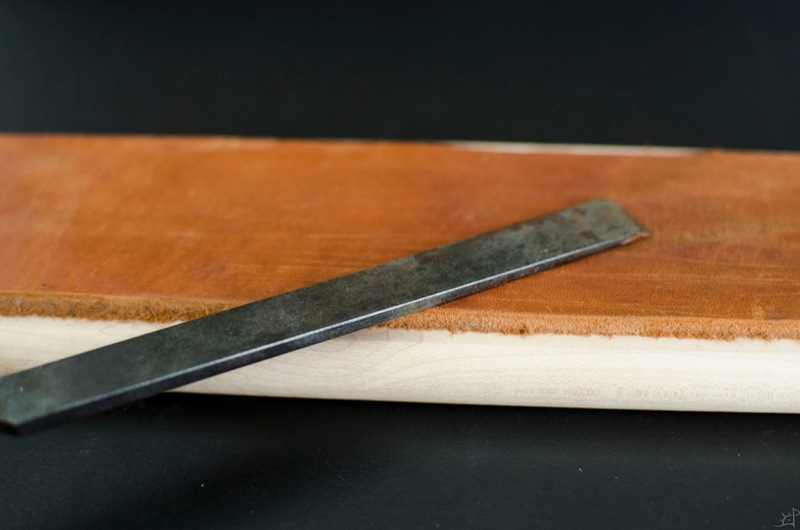 This operation minimizes the burr and keeps it from rolling excessively back onto the flat side of the chisel, although it will be removed later. Again, I move progressively through the grits until reaching the finest. Unlike plane irons, I keep as even a pressure along the width of the edge as possible so that the two corners are sharp. 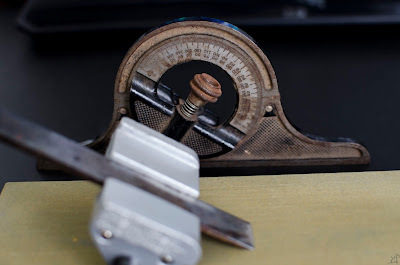 A good way to check the edge consistency is to, when establishing the rough bevel, measure it with a pair of callipers to see if it is an even thickness from end to end. With a honing guide, this is a bit easier, as it takes a lot of the side to side rolling out of the stroke. 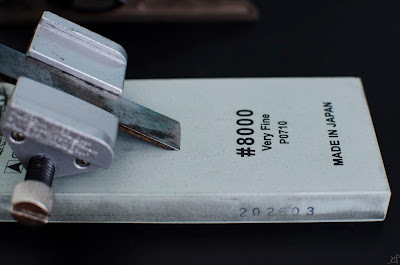 Once I have a clean, even edge to the highest grit stone, I remove the honing guide and gently polish the back once more on the #8000 stone. 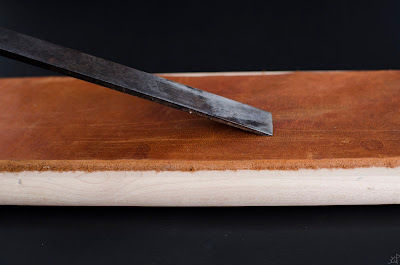 This removes the burr and ensures that the polish of the chisel back extends fully to the edge. Keeping contact with the length of the chisel prevents a microbevel from forming on the side opposite the primary bevel. Now the stones have done all they can. 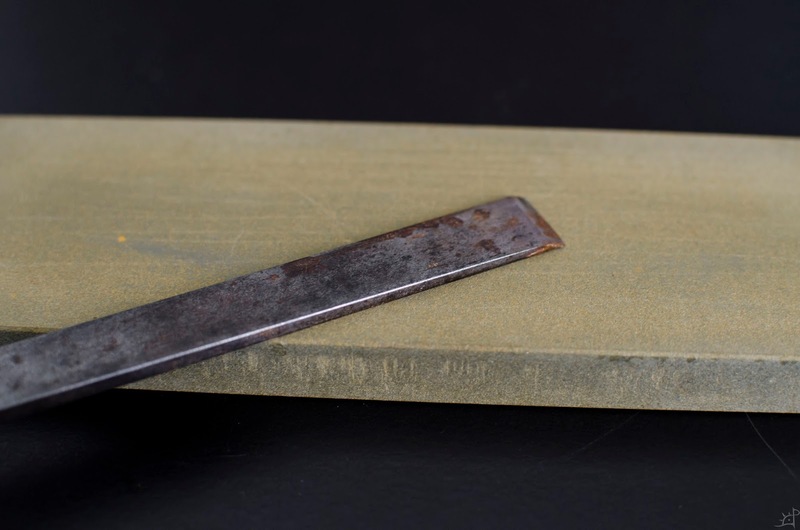 Turning to the strop, I treat it as though it is itself a stone. Keeping a consistent angle with the chisel to match the ground angle, I pull (instead of push) the blade with a firm downward pressure. Between 20~30 strokes, periodically checking the polish and burr formation, is all it takes. As with the stones, I also turn it over and strop the back, keeping the angle low so as to prevent a convex microbevel and rolling of the burr back to the other side. 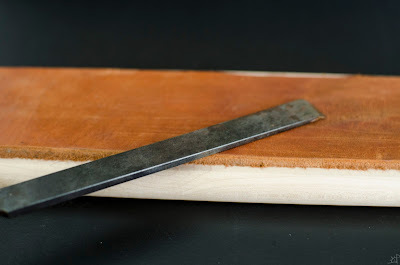 Having a skew angle to the strop (or perpendicular, but that often leaves cuts in the leather if I am not careful) will pull the burr off instead of rolling it over. 5~10 passes and the chisel is usually done. Feel for a burr and inspect the quality of the edge. At worst, there may be a few indications that the finest grit did not fully reach the edge, in which case it is simple enough to return to the stones, then finish again with the strop. With this procedure, I can return a dull chisel to shaving sharpness in about 5 minutes at most. If it is still somewhat sharp, I can start with a #5000 stone and have it honed back in far less. Speed, however, is not the objective. Slow, deliberate strokes will be much more effective in the end than quick, inconsistent ones.